I’m writing about kale. Which I suppose is a bit like toasting your fiftieth anniversary with a mug of lukewarm green tea. Make that decaf green tea. I haven’t blogged anything in about a month. Because when I am on the cusp of something significant, like a 100th blog post, I work myself into quite a state trying to think of something earth-shattering to share. Well, here it is: kale chips are delicious. Beet green chips, not so much. 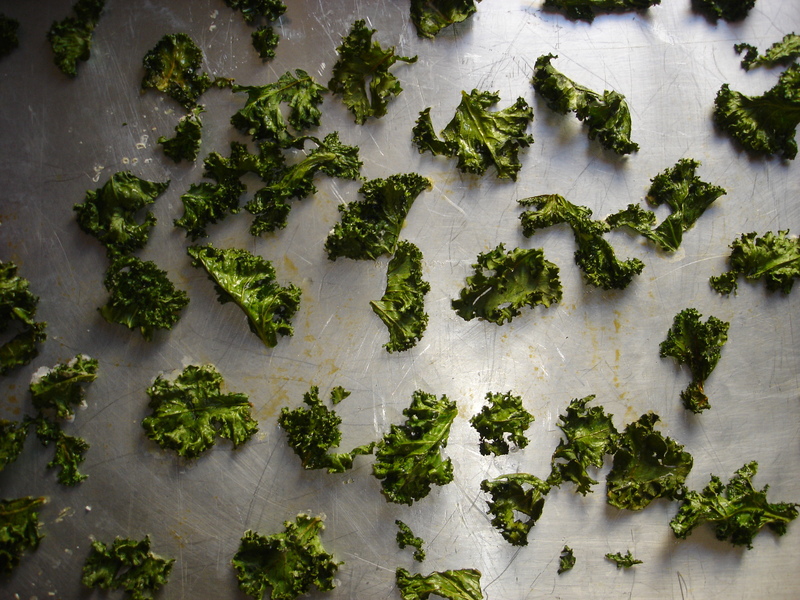 If you haven’t made them, kale chips are quick, easy, healthy, and crispy. 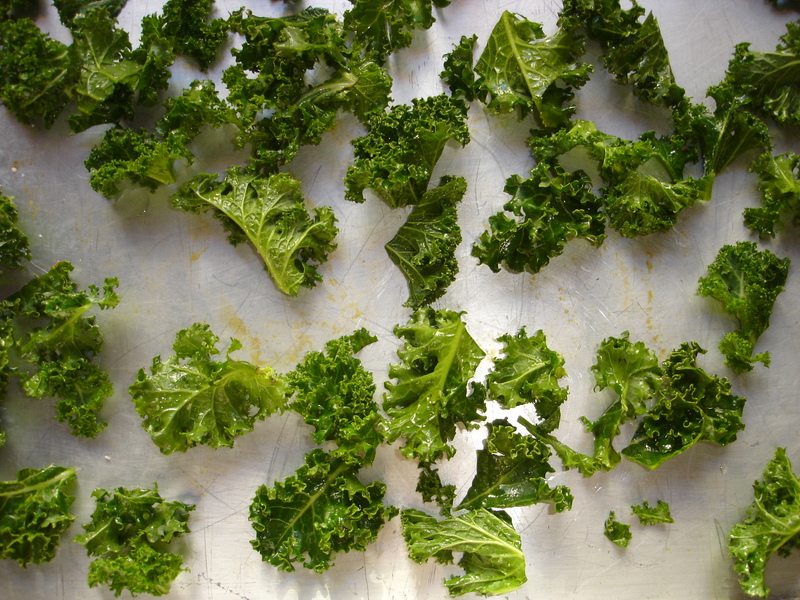 Simply wash a head of kale and pat dry, remove the hard ribs, tear the leaves into bite-sized pieces, set them on a cookie sheet, drizzle with a little olive oil, and sprinkle with a bit of kosher salt or other seasoning of your choice. 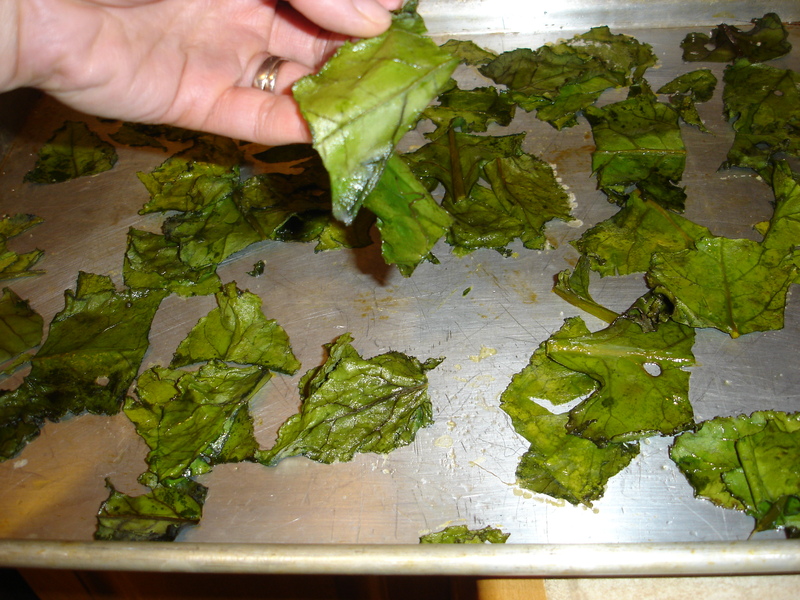 Slide the cookie sheet into a 300-degree oven for about 15-20 minutes (keep a close eye on your kale), and before you know it, you’ve got kale chips. Now, I’ll admit that no one in the house cared for these the first few times I made them. They’re crunchy but not sturdy. They’ve got a brittle quality that makes you want to give them a calcium supplement. They get stuck in your teeth. The rest of my family is not interested. The only way I can get my people to willingly eat their kale is by making this potato, kale, and sausage soup. Boy, aren’t you all just rushing to the market to buy kale for this recipe? But you should. These are worth a try. Several tries. There’s something satisfying about them that I can’t put my finger on, because it’s too busy working in concert with my thumb to pluck kale chips off the cookie sheet. Now, here’s where I get into trouble. I often get it in my head that if I can make one thing that’s tasty, then I should be able to turn a like item into something that’s even more tasty. 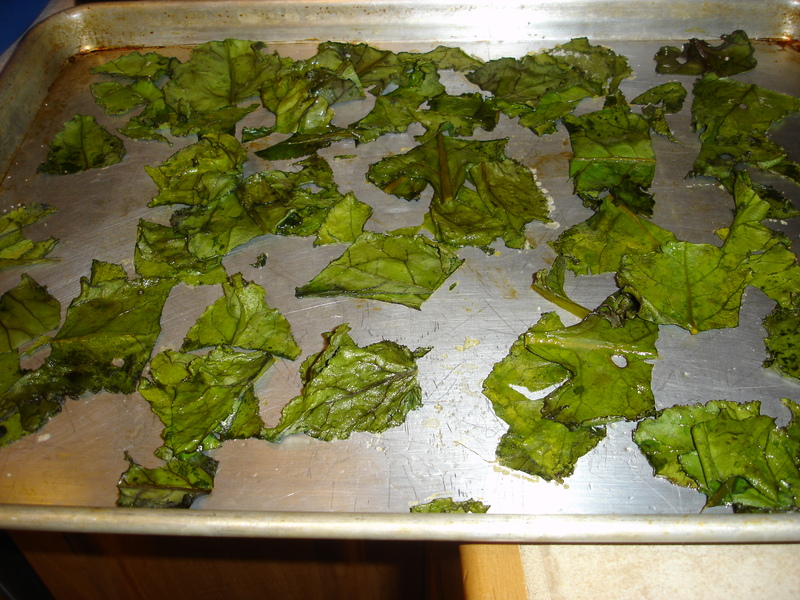 So after roasting a batch of beets, I decided to try to make beet green chips as opposed to sauteing the greens. I realized that something was amiss when my kitchen began to fill with the aroma of what I can only imagine cooked grass clippings would smell like. There aren’t enough wilted chips in the world, if you ask me. And yes, I tasted them. I lived to tell about it, but just barely. Which brings me to the whole point of this post: why I can’t quit this blog. I have a love/hate relationship with this blog. I love to share stories; I hate the pressure of trying to come up with new, interesting material. I love it when you tell me that something I’ve written made you laugh or was tasty. I hate feeling like a fraud when I share recipes–I’m not a gourmet cook. And yet, I persevere. Because you need me. Someday you’ll get it in your head to go rogue in the kitchen, and then you’ll say to yourself, “Wait a minute. I don’t want to pull a Pho Girl.” I am a living, breathing cautionary tale. Who else is going to be honest with you? Who’s not afraid to let what happens in the kitchen out of the kitchen? Pho Girl, that’s who. 1. Preheat oven to 300 degrees Fahrenheit. Wash the kale and pat dry. Remove the ribs and tear the leaves into bite-sized pieces. 2. Arrange on a cookie sheet and use olive oil and salt to season. 3. Bake for 15-20 minutes, or until kale has cooked down and is crispy to the touch. Remove from oven; cool before serving. Yay! You’re back! I sure missed you!! And I’m so glad you’re willing to go rogue in the kitchen. It gives me confidence to step out a little of my comfort zone and maybe give something new a try. Always wanted to make my own male chips. You make it look too easy! And I have a bunch of over-wintered kale in my garden. What have I got to loose?? Thanks for stopping by. Hope you've enjoyed your visit. Email us at thephogirl@gmail.com. The Adventures of Pho Girl and Nacho Man · Stuff. And nonsense.